There is nothing more precious to us than the elders in our lives. They have given us a lifetime of love and support, and in their golden years, they need the same from us. Many times medical conditions prevent us from caring for them at home. Americans look to skilled nursing facilities to provide necessary living assistance to our seniors. However, this doesn’t always go the way we would think. Elder abuse in assisted living institutions and nursing homes is flagrant and disturbing. If your family has been affected by the abuse or neglect of a loved one, reach out to an experienced and compassionate Kansas City Elder Abuse Lawyer at Smith Mohlman, LLC. We understand elder law and are prepared to fight for your family. In an ideal world, nursing home and care facilities would provide the same care and attention we give at home. But the reality is these facilities often fail to live up to our standards, or the standards of the law. A Kansas City Elder Abuse Attorney at Smith Mohlman can help you navigate the complexities of an Elder Abuse claim. A government study showed that 30 percent of the nursing homes in the United States were cited for abuse over a recent two-year period. What is worse is that for every case of nursing home abuse and neglect that is reported, there may be as many as five more cases that go unreported. Research suggests that abused elders tend to die earlier than seniors who are well cared for, even in the absence of life-threatening and chronic conditions. There is no time to waste when you believe that your loved one is suffering abuse or neglect in the care of an assisted living facility or nursing home. Our Kansas City personal injury attorneys at Smith Mohlman know full well the potential dangers of neglect and abuse. That’s one of the reasons our team commits to investigating your case as if it were one of our own family members. More importantly, we understand how incredibly difficult the decision to place a parent or grandparent in a care facility can be. Our promise is to deliver the respect and care your elderly loved ones deserve. These types of abuse or neglect are serious. They can result in injury or even death. It is important to protect our loved ones. Our skilled team understands the gravity of these situations. No one wants to be in the position of finding out that someone we hold so dear has been victimized by a nursing home or assisted living facility. If you have learned that a family member has been mistreated, you may not know what to do with the information, or where to go from there. You have rights! Missouri law provides an option to seek legal resolution for the wrongs that have been caused to your loved one or your family member. Elders and dependent adults are deemed more vulnerable, and represent a greater risk for abuse and neglect and less capable of seeking help and, as such, the law has a responsibility to protect them. The Missouri Department of Health & Senior Services is but one resource for identifying abuse and neglect. 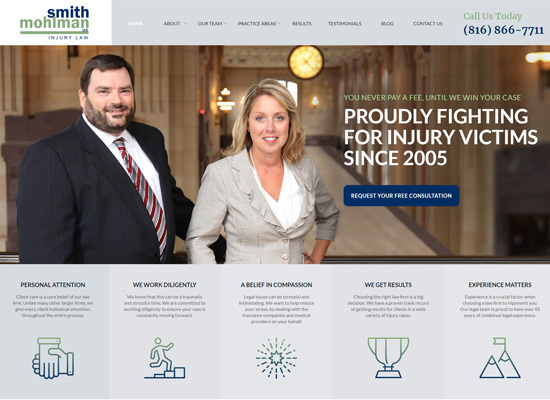 Let Smith & Mohlman be your advocate in the fight for justice. Get Skilled Representation – Call a Kansas City Elder Law Attorney Today! If you or a member of your family has been a victim of elder abuse or neglect or elder law negligence, we are here to listen – call us now, share your story, and we can give you professional legal guidance for free. Call (816) 866-7711 today or reach out to us online.